The Brush Island is a continental island, contained within the Brush Island Nature Reserve, a protected nature reserve, that is located off the south coast of New South Wales, Australia. The 47-hectare (120-acre) island and reserve is situated within the Tasman Sea, approximately 2 kilometres (1.2 mi) south-east of the coastal village of Bawley Point. The island was gazetted as a nature reserve in July 1963 and is important for breeding seabirds. The reserve is listed on Australia’s Register of the National Estate, and has an unmanned lighthouse. The island lies 350 metres (1,150 ft) from the tip of Murramarang Point. It is 880 metres (2,890 ft) long, with a maximum width of 560 metres (1,840 ft), and rises to about 30 metres (98 ft) above sea level. Its shorelines are steep, rocky cliff faces with erosion gullies on the northern side. The gullies are both caused and used by the little penguins whose tracks and burrows cover most of the island. The island was sighted by Captain James Cook on 22 April 1770 during his first voyage to the South Pacific Ocean. Cook had planned to shelter HMS Endeavour between the unnamed island and mainland but was prevented by high seas. Instead Endeavour continued its northward path along the coast, making her first Australian landfall a week later at Botany Bay. The island supports a coastal vegetation cover of herbs, low shrubs and stunted trees, including Carpobrotus glaucescens, Lomandra longifolia, Einadia hastata, Myoporum insulare, Enchylaena tomentosa, Acacia longifolia, Westringia fruticosa, Banksia integrifolia and Casuarina glauca. Seabird species nesting on the island include the wedge-tailed shearwater, short-tailed shearwater, little penguin and sooty oystercatcher. White-faced storm petrels and sooty shearwaters were found there for the first time in 2008. The island became infested with black rats in 1932 after a steamer, the Northern Firth, ran aground there. In 2005 the rats were eradicated after a poisoning campaign by the NSW National Parks & Wildlife Service. ^ a b "Brush Island Nature Reserve: Park management". Office of Environment and Heritage. Government of New South Wales. Retrieved 16 September 2014. ^ a b Murramarang National Park, Brush Island Nature Reserve, Belowla Island Nature Reserve and Tollgate Islands Nature Reserve: Plan of Management (PDF). NSW National Parks & Wildlife Service (PDF). Sydney: Government of New South Wales. 24 April 2002. ISBN 978-0-7310-0860-5. Retrieved 16 September 2014. ^ a b c "Brush Island Nature Reserve". Australian Heritage Database, Department of Sustainability, Environment, Water, Population and Communities. Government of Australia. Retrieved 21 June 2011. ^ a b Beaglehole, J. C., ed. (1968). The Journals of Captain James Cook on His Voyages of Discovery. Vol. I: The Voyage of the Endeavour 1768–1771. Cambridge University Press. p. 304. OCLC 223185477. ^ a b Woodford, James (15 November 2008). "Rat race is over - now it's gone to the birds". Sydney Morning Herald. Retrieved 21 June 2011. Murramarang National Park, Brush Island Nature Reserve, Belowla Island Nature Reserve and Tollgate Islands Nature Reserve: Plan of Management (PDF). NSW National Parks & Wildlife Service (PDF). Sydney: Government of New South Wales. 24 April 2002. ISBN 978-0-7310-0860-5. The Cocoparra National Park is a protected national park that is located in the Riverina region of New South Wales, in eastern Australia. The 8,357-hectare (20,650-acre) national park is situated 457 kilometres (284 mi) southwest of Sydney and 25 kilometres (16 mi) northeast of Griffith. Montague Island is a continental island contained within the Montague Island Nature Reserve, a protected nature reserve that is located offshore from the South Coast region of New South Wales, in eastern Australia. The nearest town located onshore from the 81-hectare (200-acre) reserve and island is Narooma, situated approximately 9 kilometres (5.6 mi) to the northwest. The Muogamarra Nature Reserve is a protected nature reserve that is located in the Sydney region of New South Wales, in eastern Australia. The 2,274-hectare (5,620-acre) reserve is situated in the northern edge of Sydney and lies between the suburb of Cowan to the south, and the Hawkesbury River to the north. Lion Island is a river island that is located at the mouth to the Hawkesbury River inside Broken Bay, in the state of New South Wales, Australia. The island is considered part of the Central Coast Council. It is a descriptive name because it resembles a Sphinx, a mythical figure of a crouching lion. Kathleen Island is a steeply cliffed island that lies within Port Davey, an oceanic inlet, located in the south west region of Tasmania, Australia. The island has an area of approximately 11.35 hectares and is contained with the Southwest National Park, part of the Tasmanian Wilderness World Heritage Site and the Port Davey/Bathurst Harbour Marine Nature Reserve. Rodondo Island is a granite island, part of the Rodondo Group, lying in northern Bass Strait, within the state boundaries of Tasmania, Australia. The island is located only 10 kilometres (6.2 mi) south of Wilsons Promontory in Victoria, and 2' of latitude south of the Victoria-Tasmania border at latitude 39°12'S. Rodondo Island is ringed by steep cliffs up to 200 metres (660 ft) high, with an area of 106 hectares and a maximum elevation of 350 metres (1,150 ft) above sea level. The South West Isle, part of the Kent Group, is an unpopulated 19.09-hectare (47.2-acre) granite island, located in the Bass Strait, lying off the north-east coast of Tasmania, between the Furneaux Group and Wilsons Promontory in Victoria, Australia. The Five Islands Nature Reserve is a protected nature reserve located in the Tasman Sea, off the Illawarra east coast of the state of New South Wales, Australia. The 26-hectare (64-acre) reserve comprises five continental islands that are situated between 0.5 and 3.5 kilometres east of Port Kembla. The Five Islands are Flinders Islet, Bass Islet, Martin Islet, Big Island and Rocky Islet. The Wilsons Peak Flora Reserve is a protected nature reserve that is located in the Northern Rivers region in the state of New South Wales, in eastern Australia. The reserve is bounded to the north by the border between New South Wales and the state of Queensland. The nearest town is the Queensland settlement of Killarney. The Davis Scrub Nature Reserve is a protected nature reserve that is located in the Northern Rivers region of New South Wales, Australia. The 13-hectare (32-acre) reserve is a sub tropical jungle remnant of the Big Scrub and is situated at 170 metres (560 ft) above sea level on an undulating high rainfall plain near Alstonville. The Victoria Park Nature Reserve is a protected nature reserve that is located in the Northern Rivers region in the state of New South Wales, in eastern Australia. The sub-tropical jungle remnant is located an undulating high rainfall plain near Alstonville. The red-brown soil is derived from a basaltic flow from the nearby Mount Warning. Of the total land in the reserve, 8 hectares is original rainforest; and the other areas are being re-vegetated. The Robertson Nature Reserve is a protected rainforest nature reserve that is located in the Southern Highlands region of New South Wales, in eastern Australia. The 5.3-hectare (13-acre) reserve is situated near Robertson on the edge of the Illawarra Escarpment and is a remnant of the Yarrawa Brush, once 2,450 hectares in size. 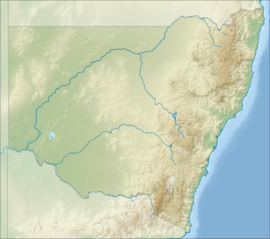 The Garawarra State Conservation Area is a protected conservation area that is located on the southern suburban fringe of Greater Sydney, in the state of New South Wales, in eastern Australia. The 949-hectare (2,350-acre) reserve abuts the Royal National Park and is situated 40 kilometres (25 mi) south of the Sydney central business district, near Helensburgh. Garawarra was gazetted as a park in 1987, and added, together with the Royal National Park, to the Australian National Heritage List on 15 September 2006. The Blue Gum Swamp is a protected nature reserve located in the lower Grose Valley of the Blue Mountains, in Blue Mountains National Park, in New South Wales west of Sydney, southeastern Australia. Situated adjacent to the Blue Gum Creek near Winmalee, the reserve is part of the Greater Blue Mountains and is within the UNESCO World Heritage Site. The Bird Island Nature Reserve is a protected nature reserve located near Lake Munmorah on the Central Coast region of New South Wales, Australia. The island is situated 1.4 kilometres (0.87 mi) off the east coast of New South Wales, within the Tasman Sea. The reserve may be seen from the lighthouse at Norah Head. The Sea Acres National Park is a national park that is located in the Mid North Coast region of New South Wales, in eastern Australia. The 76-hectare (190-acre) park is situated near the town of Port Macquarie. The park is a popular tourist area with a 1.3-kilometre (0.81 mi) long boardwalk through a remnant of seaside rainforest. There is also an education centre and cafe. The park was initially declared as a nature reserve in 1987; and gazetted as a national park in October 2010. The Little Llangothlin Nature Reserve is a protected wetland nature reserve that is located on the Northern Tablelands in the New England region of New South Wales, in eastern Australia. The 257-hectare (640-acre) reserve is situated approximately 10 kilometres (6.2 mi) north-east of the rural locality of Llangothlin, and some 20 kilometres (12 mi) north-east of Guyra. Solitary Islands Marine Park is a marine park in New South Wales State waters, Australia. It adjoins the Solitary Islands Marine Reserve and was declared under the Marine Parks Act 1997 (NSW) in January 1998. Prior to this it was declared a marine reserve in 1991. The Park was one of the first declared in NSW and stretches along the northern NSW coast, from Muttonbird Island, Coffs Harbour, to Plover Island near Sandon River, 75 kilometres to the north. It includes coastal estuaries and lakes and extends from the mean high water mark, to three nautical miles out to sea, covering an area of around 72 000 hectares. 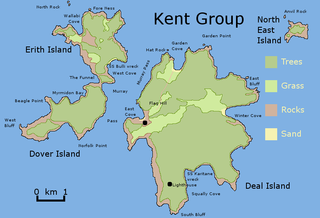 There are five main islands in the Park, North Solitary Island, North West Solitary Island, South West Solitary Island, South Solitary Island and Split Solitary Island, as well as other significant outcrops such as Muttonbird Island and submerged reefs.